Spirit of Exploration: Hundred percent India! Good to see interesting posts on your blog. We are planning to have Pune Bloggers meet in the 2nd Week of Oct 08. Let me know if you are interested to be a part of it. Is there some link where I can get information about the Pune Bloggers meets? 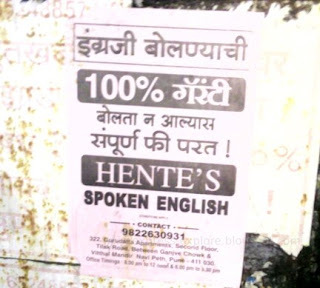 I liked this one about the Indian emphasis on assurance,"100% guarantee". Would track your blog! Best.